Solar in Space: Could Japan Become the Next Saudi Arabia? 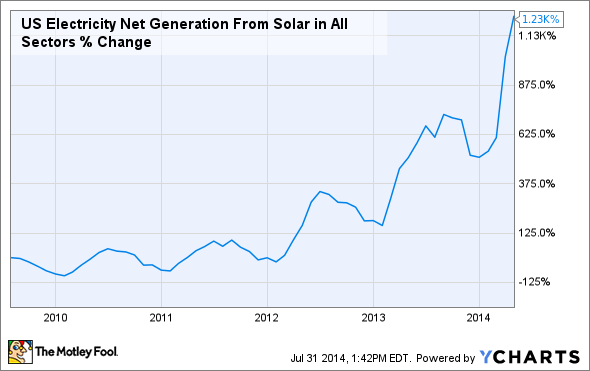 The solar industry has soared as installations keep setting new records. However, a major problem with solar power is that it isn't generated during the day. This article explains how Japanese innovators are working to solve that problem and turn the land of the rising sun into the land that powers the globe through eternal sun. Concerns over greenhouse emissions have many people concerned that humanity will have to choose between strong economic growth and a clean environment to pass on to our children. However, what these people fail to realize is that the amount of energy radiated upon the earth in just one hour could power the entire globe for a year. Steady improvements in photovoltaic technology over the last few years have resulted in incredible declines in the cost of solar power. In fact, between 2011 and 2013 solar system prices in the US declined by 60%. This has resulted in an explosion of US solar power generation, which has grown at a 68% annual compound rate over the last five years. Internationally solar is also growing rapidly thanks to costs achieving grid parity (without tax subsidies) in 19 countries including India, Mexico, Australia, South Africa, and the Middle East. According to energy analyst firms GTM and IHS, between 2014 and 2020, $1 trillion will be invested as solar installations grow 18.2% annually. However, if solar energy is ever to achieve its full promise to mankind it must overcome its single greatest fundamental flaw. No matter how much solar panels improve in efficiency or come down in cost, the fact is that solar panels don't produce power at night. In addition, things like cloud cover and storms make solar power output highly variable. Another problem is that 30% of sun's energy is deflected by the earth's atmosphere, forever unavailable to earth-based solar systems. Thus earth-based solar seems bound to only help augment traditional "base loads" such as coal, nuclear, and gas power generation. However, scientists around the world, including America's own Lawrence Livermore National Laboratory, have devised an innovative method to solve this problem. These scientists have worked out an innovative system in which satellites are launched into space with large, inflatable mirrors. These mirrors would focus the sun's undiluted power onto high efficiency solar panels -- generating electricity. This can be transmitted back to earth in two ways. The easiest method is with high powered lasers. Each laser satellite would weigh about 10 tons, cost about $500 million, and be the size of a kitchen table. The satellites would orbit 247 miles above the earth and beam back continuous solar energy at 50% efficiency which is far superior to today's best commercial solar panels -- they are expected to reach 23% efficiency by 2015. However, before we start celebrating the end of the energy crisis, let's consider the limitations of this system. The biggest problem with laser-transmitted, space-based solar power (SBSP), is that each laser satellite could only generate 1 MW to 10 MW of power. Thus, it would take at least 100 such satellites at a cost of $50 billion to replace a 1 GW power plant that could power a large city. To put that cost in perspective, a 1 GW gas fired power plant costs just $1 billion to build while 1 GW of conventional solar costs $4.87 billion in the US. A more economical method of utilizing SBSP (at least in the long term) is microwave transmission. The benefit of this method is that the entire apparatus is parked in geosynchronous orbit, 21,605 miles above the earth, and so is stationary relative to the earth. Because of this it can be built to a much larger scale, easily 1 GW of capacity or more. The biggest draw backs to the microwave SBSP are that the system must be assembled in space and could take as many as 100 launches to build. This could easily drive total costs into the tens of billions of dollars. At first these astronomical costs might make SBSP seem fanciful, however the International Academy of Astronautics (IAA) supports the idea because of their belief that space elevators could lower the cost/kg of putting materials in orbit by as much as 97.5% by 2035. The Japan Aerospace Exploratory agency (JAXA) is currently working on a 25-year plan to build a 1 GW SBSP array, which is estimated to weigh 10,000 tons upon completion. This would make the JAXA SBSP array the largest construction ever placed in orbit, about 24 times more massive than the International Space Station. Right now JAXA is the world's leading proponent of SBSP due largely to Japan's precarious energy situation following the Fukushima nuclear meltdown, which resulted in 53% of Japan's nuclear power plants being taken offline -- potentially permanently. Environmental concerns are valid, however pessimistic proclamations regarding how a future energy crisis may leave us all huddled in the dark are not. Brilliant scientists, engineers, and inventors all over the world are hard at work devising innovative ways to meet the world's future energy needs and space-based solar power is just one such example of how the world's economy is in for a brighter tomorrow.